On December 21, 1918, journalist and diplomat Walter Hines Page died in Pinehurst. Born in 1855 in what’s now Cary, Page was drawn to journalism, and in 1883, founded the State Chronicle newspaper in Raleigh with financial backing from his father. By that time, Frank Page had moved to Moore County where he prospered in the lumber industry. Active in the educational realm, the younger Page was among the founders of the Watauga Club, an organization that advocated for the economic and social betterment of North Carolina, and helped what’s now North Carolina State University. In 1885, Page turned the Chronicle over to Josephus Daniels and moved to New York, shifting from daily journalism to the editorship of The Atlantic Monthly. 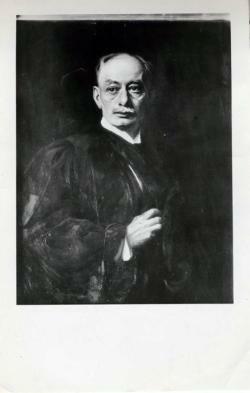 In 1899, he founded a publishing firm with Frank Doubleday. An articulate public speaker, he was a popular orator who primarily focused on education, politics and the new South. Outspoken in his promotion of Woodrow Wilson for president in 1912, Page was tapped to serve as the 28th president’s ambassador to Great Britain. After the outbreak of World War I, he was a strong supporter of the Allied side and frequently encouraged the Wilson administration to intercede. Due to failing health, Page returned to North Carolina in the fall of 1918.
or more about North Carolina’s history, arts and culture, visit Cultural Resources online. To receive these updates automatically each day, make sure you subscribe by email using the box on the right, and follow us on Facebook, Twitter and Pinterest.